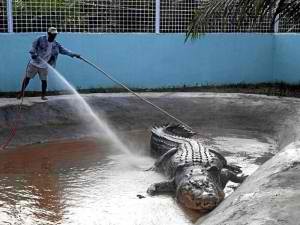 The Department of Environment and Natural Resources (DENR) Secretary Ramon Paje mentioned his plan of transferring the 20-foot crocodile named Lolong to the Ninoy Aquino Parks and Wildlife Center in Quezon City. The DENR Secretary said that he plans to place Lolong to the 7-hectare lagoon inside the wildlife center. Paje already ordered Parks and Wildlife Bureau Director Mundita Lim to take photos of the park, which will be used in convincing Bunawan government leaders and residents to give up Lolong. Ninoy Aquino Parks and Wildlife Center has a total area of 22.7 hectares. The wildlife center is the place where snakes, birds, lizards and other wild animals found in Metro Manila are taken care of. Paje believes that the wildlife center’s 7-hectare lagoon is a much better place for Lolong than the 800-square meter pen in Bunawan Eco-Park and Research Center. The lagoon inside Ninoy Aquino Parks and Wildlife Center. Secretary Paje also declared Lolong as the Philippines’ new “ambassador for conservation.” DENR will use Lolong to raise awareness on the need to protect the environment and biodiversity. Bunawan Mayor Edwin Elorde vehemently opposed the plan of the DENR Secretary. He said that he need to consult the residents of Bunawan before they can decide on the issue. He also said that the DENR is yet to inform them of the plan to transfer Lolong. Mayor Elorde said that Lolong eco-tourism in the CARAGA Region is at its peak due to the capture of Lolong. The transfer of Lolong will have negative effect to the tourism in the region. Information for this post obtained from Philippine Star and Philippine Daily Inquirer.